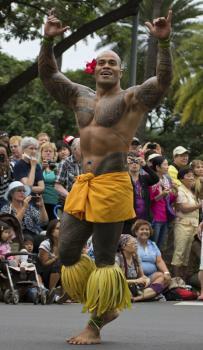 The history of the Samoan tattoo, or tatau, is steeped in cultural tradition. An important rite of passage, the ritual application of a traditional Samoan design honors the journey into adulthood and the bravery of the individual undergoing this very painful and extensive process. 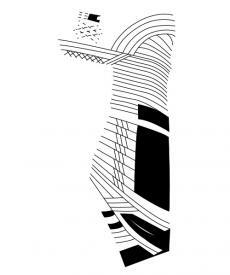 Although the deep contextual meanings of these designs remain an intrinsic part of Samoan tribal history, their aesthetic influence is prevalent in modern tattoo designs. An illustrious cultural tradition dating back over 2,000 years, the traditional Samoan pe'a tatau design consists of an intricate pattern of geometric shapes. Comprised of straight lines and sharp angles, traditional Samoan tattoos are devoid of the circular patterns found in other Polynesian tattoo styles. Extending from the middle of the back down to the knees, the pe'a completely covers the thighs, buttocks, groin, and sides of the torso. 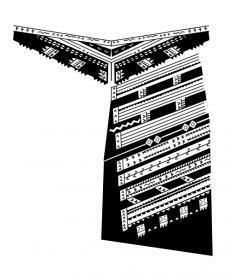 Received by adolescent males as a rite of passage into adulthood, the designs within each section of the pe'a tell a story of the man's ancestry and societal ranking, and are as unique as the individual wearer. Although not adorned with a pe'a, Samoan women have historically also received tattoos with great cultural significance and honor. 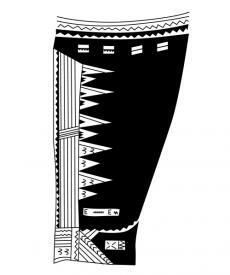 Less extensive in scope and design, the traditional tattoos, or malu, worn by Samoan women are placed on the backs of the thighs and extend down to the knees. As a sign of great tribal standing and reverence, some women receive tattoos on their hands referred to as limas. Only women who bore the lima could serve the ritualistic kava, a narcotic drink used during tribal ceremonies. Highly revered in Samoan culture, a Tufuga, or tattoo master, is trained in the process of giving a tatau, as well as the symbolic and cultural significance of the various designs and placements. This skill is passed down through family lineage. Tufuga descendants are apprenticed in the tatau ritual by older members of the family. Tufugas receive many gifts of food and handcrafted goods for their esteemed position in this important rite of passage. An arduous and time-consuming procedure, a traditional tatau is achieved by using a bone or tortoise shell comb to drive ink derived from the ashes of burned candlenut shells into the skin with a small mallet. A very painful process, the pe'a takes several sessions to complete, and each sitting is devoted to a particular area of the body. Each session can last for several days and is fully completed before moving on to the next designated region. Once started, a failure to finish the entire pe'a would bring much shame to the individual and his family and leave him to bear the mark of his cowardice, or pala'ai. 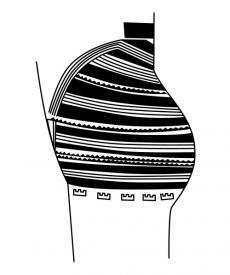 There are specific names for the designs placed on certain areas of the body, although the actual elements of the design may differ. 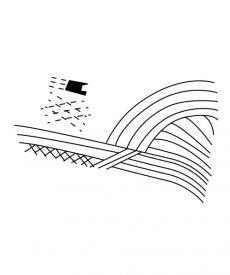 For example, the amount of lines in the saemutu, a form placed on the posterior, will vary depending upon an individual's rank in society. The images provide examples of what each section of the completed pe'a may look like on an individual, depending on individual design elements. While the traditional pe'a tatau ritual is still practiced, the scope of modern Samoan tattoo designs has expanded beyond the traditional sharp angles. 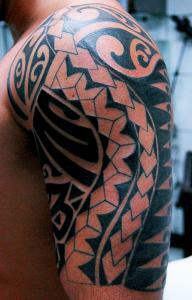 Many modern tattoos exhibit the Samoan influence of angular geometric designs, blended with the circular patterns more prevalent in other Polynesian tattoo styles. 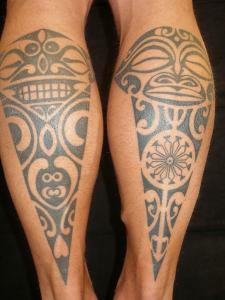 Despite the Samoan influence, many modern tattoos are often displayed on the upper arms, calves, and other areas not bound by pe'a tradition. People from around the world can be found wearing tattoo designs of Samoan influence, often incorporating symbols that celebrate nature's integral role in island life, such as flowers and animals. Rooted in cultural tradition, the art of the Samoan tatau goes beyond mere adornment and is an essential rite of passage in Samoan tribes. 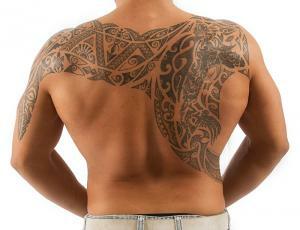 A symbol of manhood and tribal status, the traditional tatau design told a story about an individual's life. Although the evolution of modern tattooing has departed from this ritualistic ceremony, the heavy influence of traditional Polynesian design is seen in many modern tattoos.